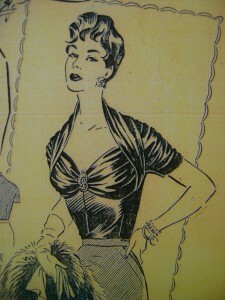 My sister has kindly lent me this draped top pattern from a French fashion magazine from 1957. It's for a 37" bust and 29" waist, so will need sizing up quite considerably. I traced it onto parchment and graded it up, but stupidly I used my sister's notes for the measurements and not my own, and had already cut out the fabric mock-up before I realised! Thankfully it was just some cheap fabric I'd had ages and not my final project fabric. My sister is smaller than me, but the fabric I'm using is stretch and the mock-up pieces actually look like the size will be OK. This is the fabric I will be using, a lovely teal knit. 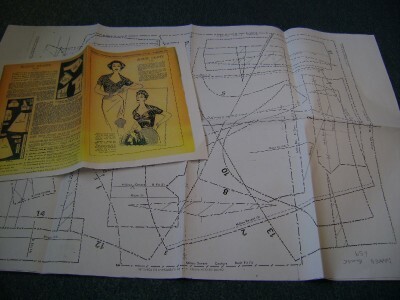 I'm planning to draft on a pencil skirt to transform the pattern from a top to a dress, and really hoping there is enough of it - the shop had less than two metres in stock but I might be able to squeeze the pieces I need out of it. I also got this silky polka dot fabric to match, but it doesn't fit in with my plan for this dress so I'll use it for something else. That colour is gorgeous! Maybe you can draft a cute little sash for around your waist with the polkadot one? It's not difficult to teach yourself to sew, I learn more about it all the time, mainly from other people's blogs! You should give it a go, starting with something simple to build up your confidence. ooo can't wait to see! Vintage finds - bumper edition! The beginnings of another addiction!